Have you ever felt like you don’t get the respect you deserve? Like people naturally take advantage of you or see you in a way you wish they didn’t? Maybe you’re a target for every salesman you meet, or maybe your boss is always assigning you the crappy jobs no one wants (and pick up some lattes while you’re at it). If that’s you—often or even occasionally—have you considered it might have less to do with how others see you and more to do with how you show yourself? That how much people respect you is determined by you, not them? I’m going to use my dog, Bella, as an example. For human to Bella interactions, her disposition is ideal. She’ll come right up to you, but she’s too afraid to jump. Even the most dog-fearing child can find a friend in Bella. In the last year, Bella has had the ever-lovin’ tar beaten out of her three times. It got so bad, my wife and I decided something had to be done to increase her confidence so every dog she passes doesn’t try to kill her. We started by training her to walk more attentively. I read somewhere that a dog’s tail up in the air signals confidence. Bella’s tail was always tucked between her legs, so I’d tie the leash around it and hold it up for her. After some months of doing this each day, it’s actually working. She walks with a little more purpose and holds her head and tail up. Other dogs have noticed. They don’t try to murder her as often. Bella has, effectively, changed herself, or at least the way others perceive her. And that perception has completely changed (okay, it has kind of changed) the way she gets treated. Changing yourself is hard. Really hard. The personality you’ve developed over time is deeply ingrained. For every possible scenario you could face, your body and mind has a response it will default to. Without serious and careful intervention, these instincts take over without us even realizing it. 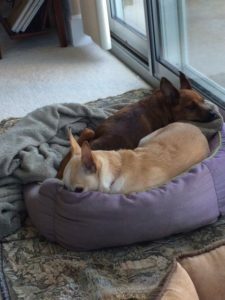 If my tiny-brained chihuahua can earn more respect just by making a few minor adjustments to her behavior, though, I’d wager you can do the same. Here’s what leads to these interactions that don’t work out in your favor and the small changes you can make to how you present yourself to get people to respect you. Until we trained her differently, Bella would crouch in fear each time another dog would approach her. That was the sign she was weak and easy to attack. Why did she react like this? In the animal kingdom, any circumstance that’s perceived as threatening gets one of three responses: fight, flight, or freeze. Bella, in almost every circumstance, chose the third. We make similar biological decisions every day, albeit from less existential threats. In these situations, it’s not the fight/flight/freeze response driving us. What we’re driven by is a similar function, but one less automatic. It’s called the law of effect and, instead of being baked into our genetics, it’s a set of behaviors we learn over time. The law of effect is a simple one: we do things that produce a positive result more often and we avoid things that produce a negative result as much as possible. It’s a curious thing, this law of effect. When you look around and see people regularly and happily doing things that lead to negative outcomes in their lives, you can’t help but wonder if it’s true. If the law of effect drives our decisions towards desirable outcomes, why do people shrink in fear when presented with opportunity? Why do they eat unhealthy foods if they know they feel better eating healthy ones? Why do they let other people disrespect them if they’re happier when they have more confidence? The answer, of course, lies in one of the biggest flaws of humans: we optimize for the short-term. You shrink away from opportunity because it makes you feel safe now even though you regret it later. You eat unhealthily now because it releases happy chemicals you don’t realize are tricking you until they wear off and you feel sick. You don’t stand up for yourself because it’s easier to let people disrespect you right now. I call this the “first relief”—the very first positive association you make with a behavior or response to a situation. Because we’re naturally short-term thinkers, we optimize for the first relief, not realizing it leads to the opposite of what we actually want. Eventually, you realize you’re not getting great results but, by then, you’ve formed a habit and it’s difficult to break. What you have to do, instead, is optimize for the “second relief”—the thing you really want. We’re short-term thinkers because it’s easy to connect what we do with immediate results. When your boss dumps all the lousy projects on you, it’s easy to connect your silent reaction with avoiding confrontation. That feels good. That’s the first relief. But if you want to start working on the projects that excite you, you have to re-optimize. You have to forgo the comfort of the first relief, and work on the second. The second relief is what leads to long-term successes. Bella the dog was able to start optimizing her behavior for the second relief because we forced her to respond differently. You have it a little harder because no one is going to force you focus on your long-term goals. But there are some things you can do to get people to respect you and change the way they treat you. Identify where you give up power or allow yourself to be dominated that leads to unwanted outcomes. You probably aren’t a pushover in every aspect of life. More likely, there are certain relationships or circumstances where you’re more passive or submissive. And, sometimes, that’s totally fine! What you want to focus on are the areas where you know you want to earn more respect. Create an alternative script for these situations to be phased in over time. Think about how you would respond in the perfect circumstance. What would you say? How would you say it? How would you portray yourself? You won’t jump directly from where you are to this ideal version of you on your first try, but it will give you some cues about how to start transitioning to the more assertive, highly-respected you that you see in your head. Practice calm assertiveness. If you picture yourself telling someone off or dominating others, slow down a bit. That’s probably all your pent-up aggression that’s never come out. That kind of reaction might feel good in the moment, but it won’t actually get you what you’re looking for (remember the danger of the first relief). Instead, practice standing up for yourself in a completely calm manner. This is the kind of behavior that gets someone’s attention (even if they don’t outwardly acknowledge it) and commands respect. Getting people to respect you and treat you how you want to be treated is such an important part of life. Now that you understand some of the psychology and physiology behind it, you’ve probably already thought of a few scenarios you could put it to use in. If not, though, here are some common areas where most people struggle to be treated with respect that you might find useful working on. Eating healthy. Refusing dessert often enough will train people to stop offering it. Getting better work assignments. Proactively telling your boss what types of projects you want to work on will train her to think of you for those assignments. If she starts to think of you as someone with a strong opinion on those things, she’ll probably start to ask you what you want to be doing and not assuming you’ll be okay with anything. Speaking up around strangers. Few people feel comfortable contributing to a group when they don’t know anyone, but if you can push yourself to do it, even a little, you’ll come off as more of a leader deserving respect. Whatever it is you work to improve, the primary requirement will be the same: discomfort. Getting yourself to wait for that second relief is not something that comes naturally. But, with perseverance and a mindset for gradual improvement, you can rest easy knowing you’re on the way to making a big shift in the way you present yourself to the world and the respect you command from those around you.